Join Private Detective Gus Gumshoe as his client, Eve presents her troubling question: where did she come from? 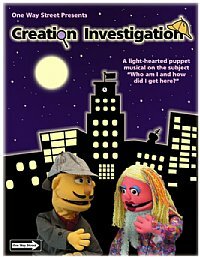 This 38-minute musical leads you through the investigation as they examine the evidence of creation. Jimmy the Squealer gets involved as they hit the city streets for more clues. Six fun songs along with some great humor helps Eve to conclude God is the Master Designer. All dialogue and songs are recorded on CD which is included in the script book. Production tips offering you several options how to perform each song are part of the book. We even included some clipart that you can use to make scenery, props, or program posters, etc.